Μυστήριον ξένον, ὁρῶ καὶ παράδοξον· οὐρανὸν τὸ Σπήλαιον· θρόνον Χερουβικὸν, τὴν Παρθένον· τὴν φάτνην χωρίον· ἐν ᾧ ἀνεκλίθη ὁ ἀχώρητος, Χριστὸς ὁ Θεός· ὃν ἀνυμνοῦντες μεγαλύνομεν. A strange and wondrous mystery do I behold: the Cave is a heaven, the Virgin a throne of the Cherubim, the manger a place wherein is contained the Uncontainable, Christ God, whom do we magnify in hymns. 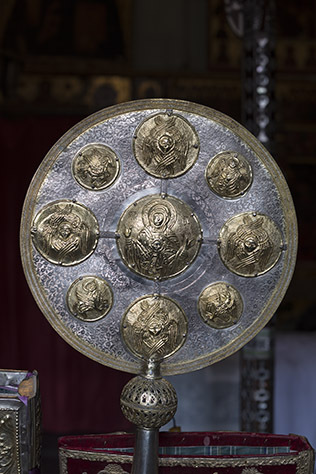 A Sinai ripidion depicts the Virgin Mary and the Christ Child in the centre, surrounded by four medallions depicting the six winged Seraphim (Isaiah 6:2), and another four depicting the four Living Creatures that accompany the throne of God (Ezekiel 1:26). It seems especially appropriate at the Nativity of Christ, when we praise the Virgin Mary as a throne of the Cherubim. By the way dear Father Justin, do you have an icon from the Virgin Mary of Saint John Damascene? It is beautiful, and when I magnify the photo by clicking on it, all the intricate detail becomes crystal clear, even the tiny blossoms embossed (if that’s the correct word) on the silver background. Thank you for this beautiful picture. It is my opinion that the four living creatures depicted on this ripidion have a secondary purpose: to signify the Four Gospels. Matthew-a winged man, Mark-a winged lion, Luke-a winged bull and John-an eagle. Blessings to you.